Experimente la cultura y las tradiciones duraderas de la región vinícola de Champagne en un tour guiado de cata de vinos desde París. Con un pequeño grupo de compañeros entusiastas del vino y un guía experto, pase un día completo visitando tres distinguidas casas de Champagne, como Mercier en Epernay o Tattinger en Reims, para degustar ocho muestras y conocer las variedades locales. Su excursión incluye recorridos por la finca, un delicioso almuerzo y sesiones de degustación íntimas en un entorno natural impresionante. Visita guiada de 12 horas a París. Participar en ocho catas en tres productores locales en el territorio de la vinicultura de Champagne. Admira las impresionantes vistas de la campiña francesa. Conozca la historia y los métodos tradicionales de la producción de champán con una guía conocedora. El tour incluye el transporte de ida y vuelta en autobús desde Les Halles en París. El formato de grupo pequeño promete atención personalizada. What a fantastic day with Vincent. The experience of visiting one large Champagne producer and two smaller ones was a nice contrast. I loved all three. We had the pleasure of a terrific lunch at the second stop - which was way more than I expected !! The tour is limited to 8 people and we were back in Paris by 5.30pm. What a wonderfully magic day. My partner and I learnt all the intricacies to Champagne production all while enjoying beautiful champagne, which there was plenty of. Our guide was super knowledgeable and was able to answer all questions thrown at him even ones not directly related to champagne. The morning starting with coffee and croissant was perfect and the day was evenly spread and relaxed. Amazing trip! Well organized and drank a lot of champagne! If you do one thing when you are in Paris, this should be it! I searched for months for the perfect tour before landing on this one and I am so glad we did. My husband and I were in France for two weeks and this trip was by far the best day thanks to our tour guide Frederick and the experience given to us. The vineyards they selected for us to attend, the amount of wine sampled, the delicious food served, the knowledge shared and the friends made created a once in a lifetime experience. If I could live this tour day in and day out I would. There are no words that could describe the experience we enjoyed and we thank you for showing us such a lovely time! This is a great tour for people who not only want to taste Champagne but also want to learn about it. The small group format made the day a very personalized experience and allowed us to go to both a big producer and two very small producers. We got to talk with the winemakers and see their hands-on methods of production. We had a fabulous catered lunch on the patio overlooking the vines at one of the wineries - it was magical. Vincent, our guide, was fantastic. He is a sommelier and very personable. He provided interesting information about the region, context for the different varietals/styles and answered questions about specific Champagnes. He made the trip easy, enjoyable and interesting. I felt like a guest for the day, not a tourist. What a fun day! We started off with coffee and croissants. After a short ride to Reims, we took in some of the sights. A quick visit to Cathedral of Notre-dame in Reims. Absolutely breathtaking. From there we went to one of the big champagne houses, Taittinger. Found out Ive been pronouncing it wrong all these years. Anyway, what a spectacular tour. Learned so much about what goes into making champagne. The chalk caves were amazing. Something you really need to see for yourself. After a taste of champagne at Taittinger, we headed over to a small independent family run champagne house. We took a tour of the grounds, then sat down to a nice lunch. We were shown how to saber a champagne bottle and tasted some fabulous champagne. Quite a fun time was had by all. Our last stop was an all organic champagne house. Small and family run. We toured their facility and learned about their process. Had a few tastings as well. I have to say, that was some of the best champagne of the day. I dont think you can go wrong with this tour. It was a full day of learning and fun. What a fund day. We started off with coffee and croissants. After a short ride to Reims, we first took in the sights. A quick visit to Cathedral of Notre-dame in Reims. Absolutely breathtaking. From there we went to one of the big champagne houses, Taittinger. Found out I’ve been pronouncing it wrong all these years. Anyway, what a spectacular tour. Learned so much about what goes into making champagne. The chalk caves were amazing. Something you really need to see for yourself. After a taste of champagne and Taittinger, we headed over to a small independent family fun champagne house. We took a tour of the grounds, then sat down to a nice lunch. We were shown how to saber a champagne bottle and tasted some fabulous champagne. Quite a fun time was had by all. Our last stop was an all organic champagne house. Small and family run. We toured their facility and learned about their process. Had a few tastings as well. I have to say, that was some of the best champagne of the day. I don’t think you can go wrong with this tour. It was a full day of learning and fun. My Mom and I had a fantastic time on our tour led by Pierre with 4 other travelers! Pierre was once a winemaker himself, so he was very knowledgeable about wine and was able to answer all of the questions our group had. The tour begins at O Chateau, a wine bar in central Paris. Do not be alarmed if you arrive at the bar a half hour early like us and the door is locked and the street relatively deserted remember, its pretty early in the morning when this tour begins. Pierre arrived just a couple minutes after the scheduled start of the tour and let the group inside O Chateau, where he offered everyone croissants, freshly brewed coffee, and water. While anyone who was interested ate, Pierre gave us an introduction to French wines in general and, of course, champagnes. We then boarded the minivan for the two hour drive to Reims. On our tour, we visited three different wineries. Our first stop was Taittinger in Reims to see their chalk caves, get an overview of the process of making Champagne, and sample a glass in the tasting room. At our second stop, Vincent Brochet, we briefly toured the cellars before enjoying a delicious 4-course lunch prepared by a retired Michelin chef in the winerys beautiful, intimate tasting room overlooking the vineyards. One of the ladies on our tour even got to open our first bottle of champagne with a saber! With lunch, we tasted two champagnes, one of which was very unique and spicy, unlike any champagne anyone on our tour had ever tasted our guide even referred to it as a Champagne UFO. Our third stop was Forget-Chemin in Ludes, where we toured the vineyard and winery to learn about every step of the process of champagne-making, from harvest to grape mashing to first fermentation to disgorgement to second fermentation. 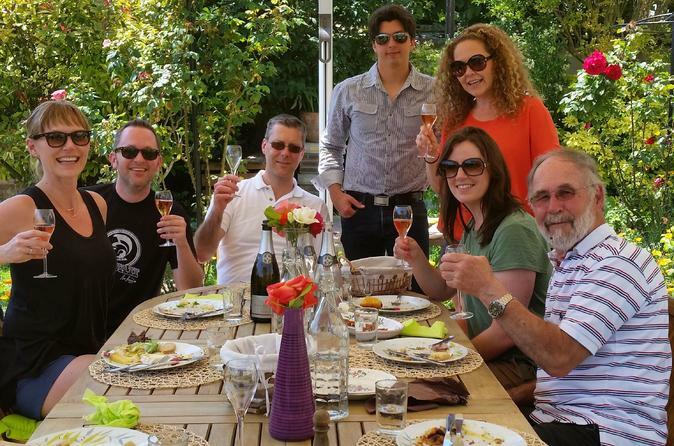 We sampled three different champagnes at Forget-Chemin, two while touring the winery and a third in the tasting room. Finally, Pierre drove us back to Paris, where the tour ended back at O Chateau. This was my Moms and my first time in Champagne, and this tour provided a great introduction to the region. This tour really focused on wine tasting and the process of champagne-making rather than sightseeing. We definitely recommend this tour! This trip to the champagne region was amazing. It was so much fun and I would highly recommend it. The lunch we had was wonderful and the champagne was fantastic. Great trip to the champagne region with great tour guide. 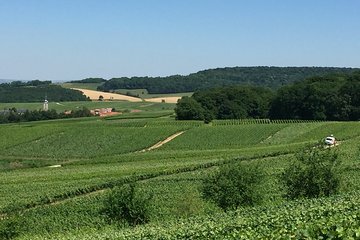 Our trip consisted of travel to and from Riems with our guide and three tastings at three champagne houses with tours and a great lunch at a boutique champagne house with a few glasses of champagne. We also visited the Riems Cathedral which was beautiful.